Nothing can be as healthy as having avocados daily since they fulfill the requirements of all the essential nutrients that we need every day. So it won’t be wrong to say that an avocado a day keeps the doctor away! Making a salad dressing out of these avocados is the best way to eat them daily. 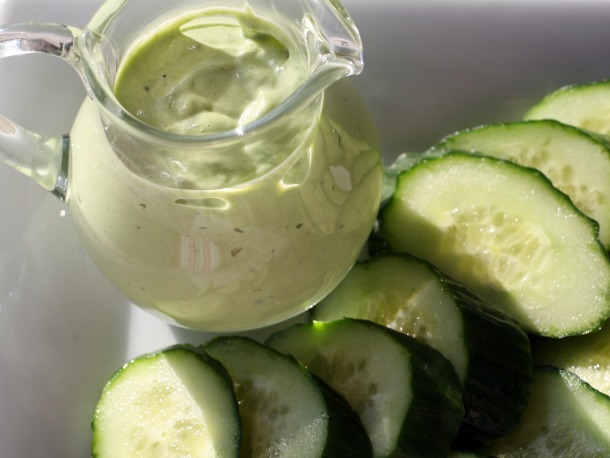 Avocado green goddess dressing is a super tasty side dish which when combined with some grilled meats or sandwiches, salads or burgers gives an amazing taste. Enriched with more then 20 essential nutrients including fiber, this dressing also helps in getting the food digested. So try this recipe if you are a great fan of avocados and are also aware of its benefits. It will not take you much time to prepare this salad dressing and all you have to do is to get the fresh veggies from the market and then get them chopped. After preparing the dressing, it is usually refrigerated in order to get a rich taste and sometimes for as long as three days. So plan beforehand if you want to make this dressing. Before getting started, wash all the veggies and make sure that they are fresh and upright. Now take the avocados and mash them. After this, gently chop the parsley and set aside. In a bowl add the yogurt, avocados, parsley and toss. Now add the stated amount of vinegar, salt and black pepper in the end. Refrigerate it until all the ingredients get blended properly. When it gets chilled, whisk it one more time and then serve.